Conservation Unit (CU) Snapshots are short graphical reports that summarize key information about the state of a distinct salmon population (or CU) and its habitat. 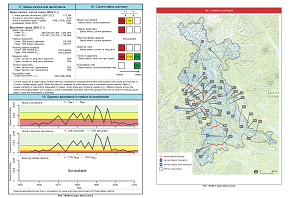 This project developed snapshots for every CU in the Skeena watershed. Snapshots include information on both biological status (e.g., abundance trends) and habitat status (e.g., development pressures). Snapshots are intended to serve as reference documents to support discussions about the state of Skeena salmon and their habitat, as well as priorities and approaches for their conservation and management. More generally, the snapshots aim to make information on the state of Skeena salmon available to a broad audience. Or download all snapshots at once as a single (VERY LARGE!) pdf file. A full report describing the project's methodology and results.